Hanaōgi (literally, “flower fan”) may well be the most frequently depicted woman in ukiyo-e. In fact, Hanaōgi was a pseudonym used by several generations of prostitutes from the Ōgiya house, one of the most exclusive brothels in the Yoshiwara. 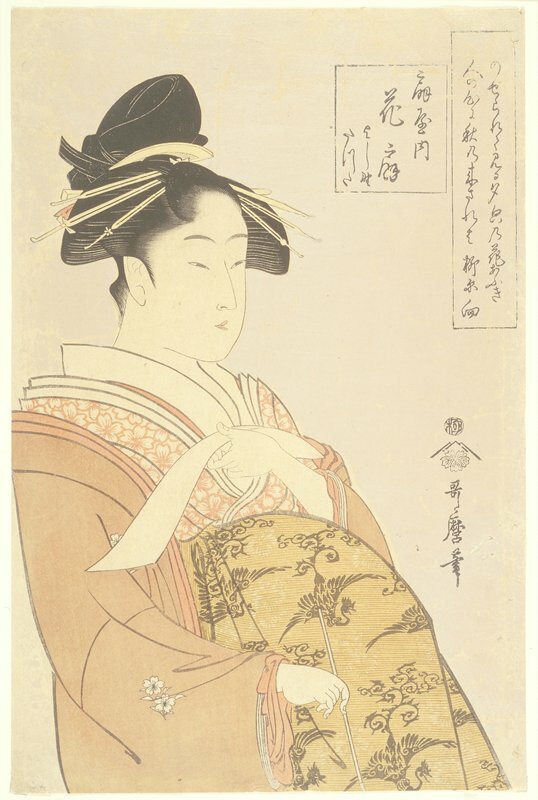 This print represents Hanaōgi IV, the highest-ranked prostitute in the Ōgiya from 1791 through 1797. The oblong cartouche contains a poem comparing the pale beauty of Hanaōgi by moonlight to a delicate moonflower. Blossoming moonflowers arranged on a flower-fan and Hanaōgi’s face after moonrise are so adorable that people never tire of seeing them and forget that autumn is coming.